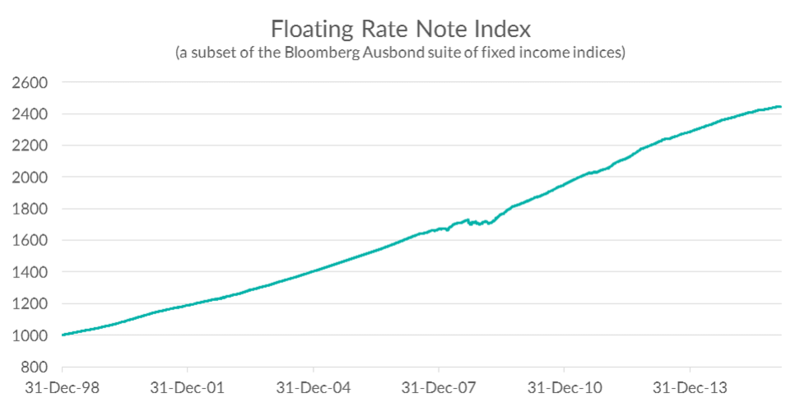 The chart below shows Total Returns from bank floaters over the long-term. The dislocation at the centre of the chart in 2008/09 was the ‘credit crises’ episode during the worst of the GFC. The Inter-bank lending market dried up and FRNs fell as much as 2-3% for a short period. But otherwise over the longer-term, these bonds have shown a characteristic of price stability. The banks trade FRNs as part of their APRA-mandated liquidity obligations. The interbank trading also provides strong liquidity in the bank FRN market, which supports narrow bid-offer spreads and is translated into similar liquidity in XTBs over bank floaters on ASX. 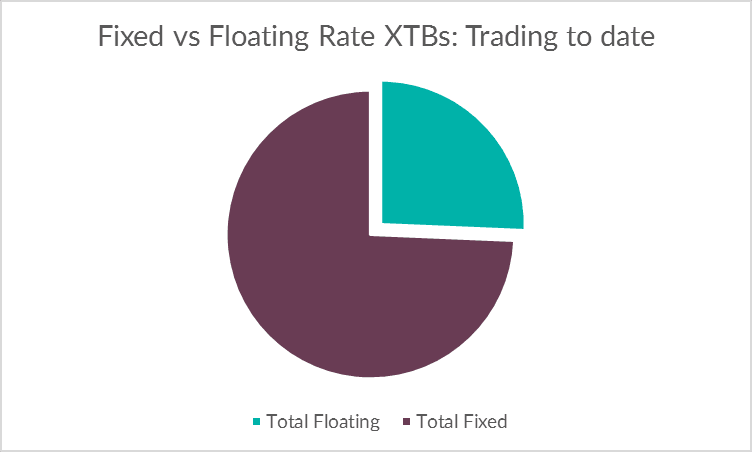 The XTB Market Maker has been consistently able to provide $2m of liquidity on both the bid and offer, around spreads in the region of 10 cents, for these circa $100 to $101 securities, or about 10bps. The chart below shows the typical saw-tooth trading pattern of the FRN as it accrues then pays out the quarterly coupon. FRNs are not bank accounts and so they don’t have the benefit of the government guarantee for the first $250,000 of an investment. But historically total returns outperform cash at 2%, for the added risk of the traded security versus the bank account. In the chart above, the BOQ FRN had only a year left to run and its chart had a very smooth line. This is because price movements as a result of credit spread changes have less and less of an impact as you get nearer to maturity. So the next chart shows the same comparison for the NAB 2019 FRN, which has 4 years to go until Maturity. Note the different shape of the FRN curve – where periods of sideways and even dips in total returns have been driven by price drops as a result of credit spread changes. If you’re looking at the two year investment picture, then the better total returns come from the NAB FRN. But at certain times, e.g., Jul-Aug 2014, and late June-July 2015 the short-term return from the cash at RBA would have beaten the FRN. The conclusion investors and their advisers should draw is that FRNs can provide competitive and stable returns compared with ‘at-call’ cash investments such as CMAs and CMTs.